THE JUBILEE PERIOD IS THE LONGEST TIME CYCLE IN THE ECONOMY OF ANCIENT ISRAEL. This cycle regulated land use and inheritances. Landowners would inherit land permanently.398 Furthermore, they could not sell the land to anyone else. Ownership had to be perpetual. The government could not take the land away or encumber it by any method. However, the owner could rent the land, and the maximum rental period was until the next Jubilee, which came every 49 years. In the 50th year, the land was returned to the owning family free of any legal encumbrances like taxes or debts, and the family was required to return to the land, after which, if they wished, they could rent it for another term of 49 years.399 This system was based on the idea that God was the ultimate sovereign owner of the land, and the Israelites were only viceroys or caretakers obligated to maintain the land free and clear of competing sovereign interests. Economists call this natural cycle the Kondratieff Wave. It lasts on average about 54 years, just over the length of the biblical Jubilee cycle of 49 years. This natural socioeconomic cycle “in the history of agricultural prices goes as far back as the year 1260 … and there is some evidence of a 50-year cycle of war and inflation in the Roman Empire”401 The Kondratieff Wave is a long economic cycle of boom followed by depression and then back to boom again. It is the longest “business cycle” or repetition of expansion and contraction caused by credit excesses and monopolies. The biblical Jubilee cycle was established to subdue or moderate natural Kondratieff Waves to prevent depressions. Human beings live about 70 years, and their economically productive life lasts about 50 years. Between the ages of 15 and 65, most people take the risks and bets of their work and investment lives. Thus, the Kondratieff wave is biologically based on human behavior. It is in the nature of people to gamble with debt, taking on more than they can handle in good times. After about 50 years, the collective impact of this debt reaches a point where it naturally collapses in an economic depression that wipes out all the debt through bankruptcy or liquidation of assets at depression prices.402 The Kondratieff Wave encompasses the mega economic cycle of boom and bust, or boom followed by crash and depression. The last time the world economy experienced the bottom of the Kondratieff cycle was at the bottom of the Great Depression in 1933. A depression occurs when the economy can no longer sustain debt to a point that borrowers are consuming more borrowed wealth than is being produced by the economy to pay back the debt. If the debts are not forgiven in an orderly fashion, it builds up until debtors begin to spend less. The reduced spending slows down economic activity until debtors are squeezed by an inability to obtain the necessary monetary resources to pay off their debt. The economy goes into a negative feedback loop of debt and reduced business until the debt load is sufficiently eliminated. The Jubilee cycle limits debt growth by seven sabbatical years, which occur once every seven years in the 49 years preceding the Jubilee year. In each sabbatical year, all debt is forgiven, which prevents debt from getting out of hand, and thus destroying the economy. It makes the creditor wiser. The creditor will not grant a business loan unless he sees a clear profit opportunity within the seven-year limit of the sabbatical cycle. It also makes the borrower more cautious. A borrower will not borrow for business if he thinks he might not be able to pay off the debt by his profits before the seventh year, because then he might not find a willing lender in the next cycle. The only biblical stipulation on the creditor’s wisdom of loaning money was that he was morally obligated to give a loan of food or clothing even when it would have to be forgiven in the seventh year. Finally, the Jubilee year came, and all property was returned to its original sovereign owners. I call them sovereign owners, because they paid no property taxes on the land. The claims of outside parties, on the owners’ use of the land, were limited to biblically recognized injuries that ill use of the land might cause to others. In America, for example, there are few sovereign owners of the land. Everyone pays a property tax, except religious institutions large enough to be exempt. These taxes are variable, and changes have often been made to discriminate between various classes of business. Also, the government can even take away property if they believe the owner is not generating enough business to pay them more taxes. They sell the land to the business owners who are able to pay higher taxes. In the Bible, God is the sovereign of sovereigns. He is the ultimate owner of the land and the people who use it are merely his viceroys. The people were to pay two 10% tithes, but these tithes were not a tax on the land itself. If an owner chose not to grow anything or he chose not to raise any animals, but only to hunt his land, and gather plants that grew wild for his own use, then no tithes were owed. There was no way the land would be confiscated because the owner chose to enjoy it rather than building a corporation on it. In the Jubilee, the property is returned to its original owners. If foreigners immigrated, then they were to be given an inheritance. The Jubilee prevented land assets from being concentrated in a few hands. This effectively prevented permanent monopolies from forming, because anyone who rented much land had to return it in the Jubilee, which had the effect of breaking any monopolistic use. The original owners, however, might choose to keep any business established on the land if it was still profitable. The Jubilee ensured that land remained in many hands and not a few. The sabbatical year sub cycle ensured that debt did not overburden the economy. This allowed free market forces operate in a manner most efficient to the development of maximal wealth in many hands, and it prevented a natural depression from crashing the economy. The benefits of the septennial debt forgiveness and the redistribution of land in the Jubilee were so great that the Israelites could afford not to sow or reap their land in those years. This was true as long as another foreign power was not interfering in the life of ancient Israel. Therefore, it became a law to let the land lie fallow403 every seventh year and the Torah404 gave God’s promise that there were be more than enough to eat. It is clear: these laws were enacted with a thorough understanding of economic cycles. Another economic benefit of the periodic debt forgiveness of the Jubilee cycle is that it prevents financial institutions from amassing wealth through the charging of interest. If all debts were forgiven every seven years, then the bank could never gain control of the whole country. No one could add house to house and field to field. Capitalistic Monopoly would be impossible if the biblical system were followed. Furthermore, this debt forgiveness prevented the abuse of paper money. If anyone tried to create a paper currency (with the intention of creating inflation), then he would have to seize control of the people’s gold and silver to the extent that they would be forced to trade in the paper currency, so that they could not preserve their buying power through real money.405 However, in the Jubilee system, the government could not add house to house and field to field, so the government could never get control of the people’s gold or silver; nor could it manipulate the price. Biblical lenders are constrained by the Jubilee cycle because once every seven years the credit cycle ends. This means that they cannot lend what they do not actually have. In modern banking, a depositor puts his money in a bank, and then the bank lends it out. The depositor does not know that he is making a loan when he puts his money in the bank. If the debt is canceled in the seventh year, then the bank will not have the depositor’s money. Therefore, a lender can only lend its own money. A bank would have to use its own capital and not the capital of the depositors.406 The Jubilee cycle and the natural Kondratieff wave also have prophetic significance. One can estimate the time of the next depression using the Kondratieff period of 54 years. The Jubilee cycle would prevent a high amplitude Kondratieff wave from occurring, and if the Jubilee principle were followed one might not even be able to detect the Kondratieff wave being suppressed. Since the Jubilee principle is ignored by the nations of the world, we may naturally not expect the fullblown Kondratieff wave to be exactly synchronized with the biblical Jubilee period. However, once the biblical Jubilee period imposes credit and monopoly controls, we may expect that the human behavior predicted by the Kondratieff wave will coincide with the Jubilee cycle. Another benefit of the Jubilee cycle is that it does not require economists schooled in the theory of John Maynard Keynes407 to try to inflate the currency to prevent recessions from turning into mini-depressions. Keynesian credit expansion and contraction, and limited debt forgiveness through the disruptive creation of inflation is a high wire act that is ultimately overcome by the high winds of credit collapse as people become lazier and lazier in their lending and borrowing discipline. The Jubilee cycle, in a sense, preempts natural depression, as expressed in the Kondratieff wave, by imposing its own artificial depression. In the seventh sabbatical year (the 49th), there is a land rest, and this is followed by the Jubilee in the 50th year, which is another land rest. Thus, the land rests for two years from sowing and reaping. This is a two year cessation of the fundamental driver of ancient economies: agriculture. When agriculture pauses, business based on agriculture also pauses. This is a voluntary depression or cessation of the fundamental business for two years. Therefore, instead of being caught by surprise by the end of the Kondratieff wave, ancient Israel planned to cease the main business for two years by saving food and supplies. As Austrian economists will tell you, the only way to defeat a depression is to stop borrowing and to start saving. By saving at the critical moment in the cycle, and volunteering to reboot the economy by reduced business, the horror of collapse brought on by uncontrolled credit induced growth is avoided. If one superimposes the last five Jubilees on the Kondratieff wave, it becomes apparent that there is a strong correlation. 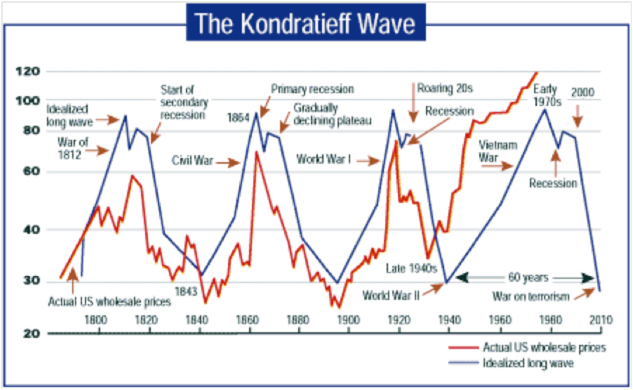 Compare the Kondratieff wave bottoms to the Jubilee cycle. The amazing result is detailed in the chart, with the red dashed lines marking the Jubilees. At or near the bottom of every long wave cycle lies the actual time of the biblical year of Jubilee! Moreover, in those few cases where the Kondratieff wave did not end at a Jubilee, there is usually a severe downturn. This is in the cases for which we have data, such as the 1987 to 1992 recession. I also note some data that are not on the chart. The Tulip bubble crashed in 1637 in the 43rd year of the Jubilee cycle, just six years before the Jubilee. Prechter shows a minor dip in 1740 in the 48th year of the Jubilee (pg. 451). As noted above, the 1987 stock market crash (a Jubilee year) did not really see the end of the cycle. It only produced a severe recession. Supposing the Kondratieff wave could be detected as far back as 1260, this author has seen nothing to rule out further correlation with the timing of the biblical Jubilee cycle. Not every economic downturn corresponds to a Jubilee. The cycle from 1720-22 ended in 1784, some 62 years later. 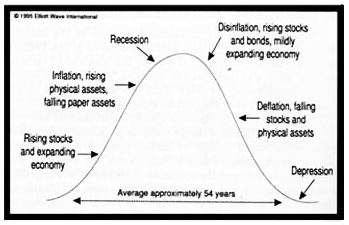 While the average is 50 years or so, there can be deviations in unusual circumstances, such as was the case with the unusual speculation of the South Sea Bubble.408 By observing the unusual factors that might drive a particular long credit/debt cycle to extremes we can explain the anomalies. This 62-year long cycle compares to the present cycle very well, and the reasons it is longer than usual are not hard to find. If we start in 1949, the last bottom, and add 62, we end up on 2011. By his calculation, Robert Prechter predicts a bottom between 2003 and 2011. I believe we will hit bottom in 2007. The prolonging of the current cycle is explained by the discovery of cheap oil in the 1930’s in the Middle East, and the Central Bank’s exploitation of this asset via fractional-reserve banking to prolong their credit expansion until Peak Oil is reached. The Banking system that would have collapsed much sooner has been saved by cheap energy prices. No one really knows when the end of the next credit cycle after this one may occur. It is likely that the crash will be so severe that there will be a long delay before the worldwide economy rebalances itself after washing out excess debt and unbalanced trade. Naturally, one could probably time a 50 year period from the start of the next expansion, but a long deep bottom is going to occur which will rival the economic bottom after the fall of the Roman Empire. It could be that the depression is continuous and lasts until the next Jubilee in 2035. The depression will begin in 2007, and the world will never recover from it. In fact, the world may have to give up their trust in fiat paper currency for a time. They will turn to gold and silver, and the middle east will be revalued, where there will be a local recovery. The government managed to depress oil prices once more in late 2006 by getting a major brokerage company to change its index weighting of unleaded gasoline futures. This caused the net selling of oil futures in a situation where the fundamental supply and demand outlook did not warrant it. Robert Prechter, At the Crest of the Tidal Wave, compares the crash and the next downturn with the crash of the South Sea Bubble, “The assessment under the Wave Principle that a Grand Supercycle is ending places the next bear market in the class of the 1722-1784 experience, which involved two Kondratieff cycle lows. The expected duration of the impending bear market … could mean that as many as three Kondratieff cycle lows will occur within it” (pg. 449). A Kondratieff wave is called a Supercycle. What does Prechter mean by two lows? Each cycle is five waves long. The market rises on I, falls to II, rises yet more to III, falls to IV, and rises to its top at V. Within the bull market I-V cycle are mini bear markets, tagged A, B, C. The market falls to A, rises back to B, and falls again yet lower to C, and then the overall bull market resumes. These patterns were discovered by Nicolai Kondratieff and R.N. Elliot. We count the Kondratieff Supercycles beginning in 1784 as the Grand Supercycle. “As we read Elliot, the current bull market in stocks is the fifth wave from 1932 of the fifth wave from 1784 of possibly the fifth wave from the Dark Ages.” (pg. 64). That is pretty scary and scarier yet is that my own research confirms it. Prechter labels this Supercycle of Supercycles Millennium. “Three Kondratieff cycle lows” means is that after the projected crash (2003-2011) which I think is going to be in 2007, that the bottoms of the next three Kondratieff cycles will be progressively lower. Prechter places these in 2003, 2057, and 2111. I think that they are going to be 2007, 2034, and 2084. This is assuming that the Jubilee cycle is re-established in 2035, which will subdue the Kondratieff wave and constrain it to the biblical cycle. In the next crash, mankind is going to learn the folly of trusting in a usurious banking system that issues fiat paper promises that it fails to keep. Every man’s asset is the other man’s liability. The crash will be the Devil’s Jubilee, and hell will laugh all the way to the bank at how they duped the world with fractional-reserve banking. The reserve part will prove to be zero. The only hope left will be to appeal to God in heaven as the world starves and perishes in the chaos of war as it tries to recover the devil’s dream economy. This crash will be exacerbated by a slide in per capita energy production. Richard Duncan’s chart shows that we can expect a decline in energy use per person to reach a level equivalent to 1930 in 2030. This means that one farmer will no longer be able to feed 40 people. Twenty percent of the population, at minimum, will have to return to farming. The west has all but eliminated this trace of biblical connection by revising the bankruptcy laws in favor of credit card companies. What does God say about this? “Behold the LORD maketh the earth empty, and maketh it waste, and turneth it upside down, and scattereth abroad the inhabitants thereof. And it shall be, as with the people, so with the priest; as with the servant, so with his master; as with maid, so with her mistress; as with buyer, so with seller; as with the lender so with the borrower; as with the taker of usury410, so with the giver of usury to him” (Isaiah 24:1-2). Perhaps after that, some will be willing to reconsider some biblical institutions — like the sabbatical and Jubilee years. Any nation that patterns its economic theory this way will surely prosper, because the principles are divinely inspired. Such a nation will not be a victim of the boom and bust cycle. Will any nation listen? Will the nation that seeks the LORD hear? The Almighty says he will give people a new heart. Perhaps then, they will listen. As this last cycle has been unusually long, I believe for prophetic reasons (and apparently good historical reasons too) that the next cycle will compensate the Kondratieff wave by being unusually short or long, just as the wave corrected itself to the Jubilee period after the South Sea Bubble in 1724. The next crash after 2007 will be 2034 when the LORD ruins the economy of Babylon in one day. Another reason that the next cycle will be short will be the world’s return to a pessimistic outlook. Lenders and creditors will be much less likely to trust each other. Credit will not expand as far before confidence breaks. The economic malaise will make it harder for humans to deal with environmental threats such as the potential of the asteroid apophis to hit in 2029 or return and hit in 2036.411 Also, the severe recession of 1987-1990412, coinciding with a Jubilee period still leaves a significant perturbation in the re-timing of the Kondratieff wave. This will influence the cycle to return to its schedule. The match up between the Jubilee period and the Kondratieff wave provides us with 20/20 hindsight more than prophetic potential. It also provides us with a naturalistic confirmation of the Jubilee cycle. The world is average, but it never obeys exact averages. That is the nature of cycles. The prophetic advantage lies in understanding the biblical chronology of the Jubilee. Jubilees tend to portend world-changing events just as the Kondratieff wave underwrites world changing depression cycles. Understanding the Jubilee cycle in Scripture will increase our confidence in the wisdom of the Creator to prevent economic recessions. Where depressions end, Jubilees begin. The first depression mentioned in biblical history was triggered by a worldwide famine. The entire civilized world was involved in this famine closely associated with the end of the ice age about 700 years after the flood. Egypt managed to escape the ravages of this famine through divine intervention. God told Joseph in advance what would happen and what to do about it. There would be seven years of great abundance brought by God to prepare for this famine, and then the famine itself would last for seven years. There is a chronological clue in this timing. The hint is that the cycle of agricultural abundance and the famine matched the divinely ordained seven year sabbatical periods. The sabbatical cycle legislated in Torah, and the mention of two seven-year cycles as divine portents of plenty and famine strongly suggest synchronization is intended. Martin Anstey (The Romance of Bible Chronology) pointed out that all chronologists add up 2370 years from creation to the death of Joseph.413 There is hardly any dispute over the date of Joseph’s death, since the interlocking data given in the biblical genealogies are complete. The first year of plenty was the .30.th year of Joseph (.2290. ), since this is when he made his proposal to Pharaoh to store up all the extra grain in Egypt. These dates, .2369., and 2290, refer to the year numbers as counted from creation. They are equivalent to A.H. (anno hominum), or A.M. (anno mundi) found in other chronologists.414 All of these periods measure years from creation. The standard approach to bible chronology has always been to count years from creation. However, the B.C. year equivalent is given in the first column. Next to year, .2290. are a boxes showing .1. and 36. or the 1st of the sabbatical cycle and the 36th year of the Jubilee cycle. As counted from creation, the years of plenty really did synchronize with the seven-year sabbatical cycle, and the seven years of famine beginning in 2297. What is equally important, however, is that the seventh year of famine closes with the beginning of the year of Jubilee, .2304., marked .1/50. at the end of the seventh year. It is not necessary to contrive it. The chronological facts fit. This Jubilee might just be an ordinary and unnoticed date; however, it is chronologically significant because Joseph engaged in the activity at this time that was prototypical of the Jubilee legislation. He returned all the land the Egyptians had mortgaged to feed themselves. Furthermore, he imposed a 20% tithe on the crops produced on the land to be paid annually. This 1/5th of the crop rule is still followed among farmers in the United States as a rental contract rule. These actions are exactly parallel to later biblical legislation. In Israel, the LORD was the owner of all the land, just as Pharaoh became owner of all the land in Egypt (except for the priestly land). The people were allowed to be sovereign tenants in exchange for 20% tithes. The first 10% was paid to the priests, and the second 10% was used to attend festivals and pay the priests for educational expenses at the feasts, as the farmer saw fit. Joseph’s return of the land and exaction of 20% for the king is the prototype of the Jubilee legislation. Now this Jubilee did come on the heels of a world changing disaster, a depression so severe that the whole land was laid waste, and had it not been for Joseph, would have starved to death as well. Joseph has often been viewed as a type of Messiah also, a man come to save Israel. Joseph restores the blessing of the land to the people of Egypt in the Jubilee. Likewise, the Messiah will restore the land of Israel in a Jubilee. The next Jubilee of significance in Israel’s history comes in the fall of 1592 B.C. (.2549.). The preceding year was sabbatical (.2548.) and occasioned the conquest of the trans-Jordan territory, the crossing of the Jordan river, and the destruction of Jericho and Ai. The manna ceased in the sabbatical year, and the children of Israel ate what was growing in the land. The sabbatical year called for eating whatever grew off the land by itself. The biblical legislation called for the Jubilee counting to be renewed upon entry into the land of Israel as well as for a reading of the Torah to all Israel at the end of the sabbatical year (Deut. 31:10; p.y. 2549) and this reading took place as recorded in Joshua 8:31-35 (.2549. ), which is the Jubilee as synchronized with creation, and it is also the 1st year of the renewed Jubilee count.417 For every Jubilee year is also the first year of the counting to the next Jubilee. Once again, the Jubilee ushers in a world-changing event. After 40 years of depression, Israel is delivered into the land of their fathers in the Jubilee. Literally, the land is returned to Israel as God gives them permission to conquer it. Seven years are spent conquering the land (.2548.– 2554.) and in the seventh year (.2555., .7/7.) the conquered land is divided out as each man received his inheritance. They were able to live off the land and booty for the entire first sabbatical period, a situation that has prophetic connections with the aftermath of the Gog and Magog war. Now let us fast forward to the next Jubilee alluded to when Saul was confirmed as king of Israel. There is a strange and misunderstood text in 1 Samuel 13:1, which is often considered a chronological mistake or is mistranslated. It says that Saul was “son of a year in his reigning, yea two years he has reigned over Israel” (.3039.). This is the literal meaning of the Hebrew: “son of a year,” which means a whole year had passed and he was at the beginning part of his second year. This does not mean that Saul only reigned two years over Israel as some translators suppose, because we are told elsewhere that he reigned 40 years. The Scripture is here pointing to a special event that took place in Saul’s second year: he “sounds a trumpet throughout the whole land” (1 Sam. 13:3). This turn of phrase alludes to the Jubilee as legislated in Leviticus 25:9 (.3039.). Now this Jubilee is prophetically significant. For Saul proved to be an unfaithful king (1 Sam. 13:9-15), and the LORD said he would “appoint a man after His own heart” (vs. 14), which was king David, but also interpreted as a Messianic prophecy means the Messiah, who is Yeshua, the son of David. Yeshua will come as King of kings and Lord of lords in the “end of days” which is the year of Jubilee. Now the author did not at first notice this Jubilee. No attempt did he make to construct this chronology by matching up the second year of Saul with the Jubilee cycle! It came about that one day I noticed 1st Samuel 13:1-3 as I was researching and writing on the Jubilee of Hezekiah’s .15th. year, because I was thinking about potential allusions to the year of Jubilee. Hezekiah’s Jubilee is established by a very strong literary allusion to its original legislation. As I was thinking, and doing word searches and the word ‘trumpet’ since a trumpet is used to announce the Jubilee, I came across this 1 Samuel 13:3 passage. Quickly, it crossed by mind that the occurrence or non-occurrence of a Jubilee in the second year of Saul would be a critical test of the chronology. Therefore, it was with a bit of awe and trepidation of mind that I quickly opened the charts to .1102/01. B.C. (.3039.) to see if the Jubilee did fall in this year! To my amazement and relief it did! The chart already had .1/50. colored in next to Saul’s .2.nd year. It is not every day that multiple lines of evidence come together that mutually reinforce their own veracity. Now clearly, the man after God’s own heart is David, however, as I said, with many prophecies there is a Messianic connection to the ultimate Messiah, who is Yeshua418 himself, who will sit on the throne of David in the Jubilee. Now the next Jubilee of importance, and probably the most noticed by chronologists is the sabbatical and Jubilee combination of Hezekiah’s .14th. and .15th. years, who again is a type of Messiah. The Jubilee connection is established in Isaiah 37:30, which is an allusion to the Jubilee legislation in Leviticus 25:9ff. They were required to eat the wild growth of the land for two years, which refers to a sabbatical year followed by a Jubilee year. The time is dated as the .14th. year of Hezekiah (Isaiah 36:1; .3430.). And the second year (.3431.) is the Jubilee of Hezekiah’s .15th. year. This Jubilee is exactly 18 Jubilees distant from the entry of Israel into the land.419 Between these two points, all the other chronology fits precisely securing the chronology beyond any reasonable doubt. Now this is not all, it just gets more exciting! Isaiah 27:13 also refers to the Jubilee trumpet in both historical fulfillment and Messianic expected fulfillment. The historical reference is to the fall of Assyria and the destruction of Nineveh in the 6th month of 612 B.C. (.613/12.=.3528.=.7/49. ), which would be just days before the Jubilee (.3529.=.1/50. ), in which freedom was announced to all the captives of this land and Egypt also, which was controlled by Assyria. The antitypical fulfillment in the end of days is when Messiah blows the Jubilee trumpet420 and delivers Israel from the anti-Christ. 398 The land was initially obtained by settlement of unused land, land that had been vacated by others or forfeited in war. Usually land was divided by lots in a pioneering era. 399 The 99-year lease would be a rough equivalent of the type of rental contracts involved. 400 Pg. 443, At the Crest of the Tidal Wave: A Forecast For the Great Bear Market, Robert Prechter, Jr.
401 Pg. 3-4, Kondratieff, Nikolai, The Long Wave Cycle: Richardson & Snyder, 1984. 402 The mathematical limits of compound interest result in debt service consuming all of the discretionary income in an economy. When there is no extra income to spend, after living expenses are paid, the economy stops expanding. Further interest charges from the debt begin to consume the wealth-producing infrastructure of the economy. The contraction of business leads naturally to depression. 403 Fallow means unplanted and un-harvested. Whatever grew from dropped seeds of the previous years crops was left to grow wild for the poor and the alien. Usually the farmer himself lived off stored food from the previous year. 404 The Torah is the five books of Moses called the Pentateuch, the first part of the Old Testament. 405 When the government manages to put paper currency alongside gold and silver, the precious metal dealers, and coin dealers begin to charge a premium whenever paper money is exchanged for gold or silver. This premium is perceived as a disadvantage by the holder of paper, and so they are discouraged from converting their wealth to real money. 406 Furthermore, few depositors would have any incentive to keep their money in a bank. First, the bank cannot pay any interest due to the anti-usury laws in the bible, and second the original function of banks was not to keep money safe, but to provide a warehouse for rich merchant’s gold, so that large amounts of it did not have to be moved around. Most people have little enough real money that it can be safely stored at home. 407 Keynes was a homosexual early in life and then married a Russian girl. Julian Snyder writes, “To the students of John Maynard Keynes, author of the General Theory of Employment, Interest and Money, which justified the deficit spending of the 1930’s … the idea of the economic long wave was not only an anathema, but ranked in their minds with such absurd methods for predicting the future as Biblical prophecies and astrology” (pg. 3, The Long Wave Cycle, Kondratieff). 408 The 54-year average itself may be in error, since the modern data upon which it is based only goes back to 1784, or it may be the average in the last three centuries, while the average in preceding centuries may have been a bit shorter, say 48 years allowing for an overall average of 49 years. 409 There is much controversy about Peak Oil. Peak Oil is not the exhaustion of oil supplies or production. It is the moment of maximum output. Actual supplies will go into a very slow decline after the maximum, and abundant coal supplies provide the necessary resources for the world to transition to alterative energy. Peak Debt, and a pessimistic and disruptive transition period will result in war and depression. Oil prices may rise dramatically as long as world industry believes it is not in a depression, just long enough to trigger the unwinding of the Kondratieff wave in a Grand Supercycle Depression. The resultant depression will make it impossible for the energy resources to get to the market, even if it is agreed that they are abundant. 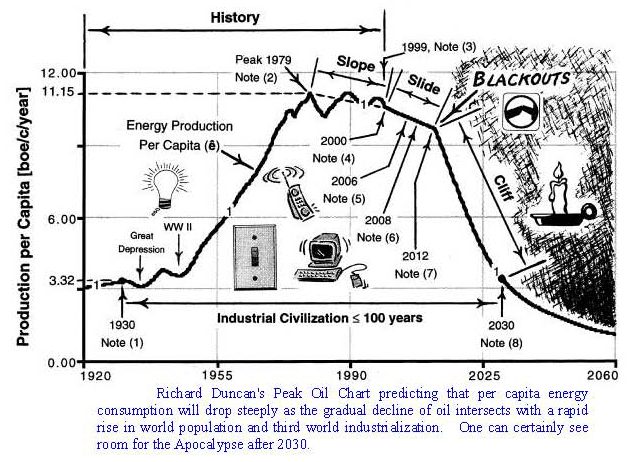 The Peak Oil chart is from Richard Duncan’s Olduvai Theory paper (cf. http://www.dieoff.org). 410 Usury is charging interest on money lent. Biblical law forbids the practice, and any entity that is allowed to constrain people to pay interest will soon control the entire world economic system. Banks have conquered more land, countries, and peoples than all the worlds armies combined. The bible prophesies that God will settle accounts with them. 411 These asteroids are invisible until they get very close, and the course projections are based on the assumption that nothing else unseen perturbs their orbit. In ancient times people feared such objects even more because they actually did get hit more frequently, and they had even less understanding of their causes (see In The Beginning, by Walt Brown). 412 1987-1990 would have been the end of the Kondratieff wave, but the Federal Reserve Bank and Economists have deceived America by opening up unprecedented free trade without balancing trade. America has thus been enabled to export all of its credit excesses to the rest of the world. The rule then seems to be that credit excess must max out at 50 years or so unless a fresh market can be found that is able to absorb the credit excess. Such unbalanced trade, of course, would be impossible without cheap oil and global fractional reserve banking. 413 Or 2369 if one must count the first year of the world with a 0. But this oft seen practice makes no more sense than counting the fingers on your right hand with a 0 (See Anstey 251.6). 414 Latin phrases for “year of man” and “year of world” respectively. Jewish chronologists call their creation era minyan liyetsirah or minyan ha olam or libriat ha olam (Finegan, §204). 416 Other than just plain not looking at the case, the other factors in missing the connection would be unfamiliarity with Jubilee legislation so that a connection is not made, and misinterpreting the Terah-Abraham connection, a problem previously solved by chronologists, but easily confused. 417 The 50th year and the 1st year of the counting are the same year. This inclusive counting keeps the seven year sabbatical cycle consistent. 419 By calculation: .3431. – .2549. = 882. And 882 / 49 = 18. The Jubilee period is seven sabbatical periods (7×7=49) and this divides evenly into the whole period. 420 The Jubilee trumpet is sounded on the day of atonement. It is also called the ‘great trumpet’ or the ‘last trumpet’ (1 Corinthians 15:52).